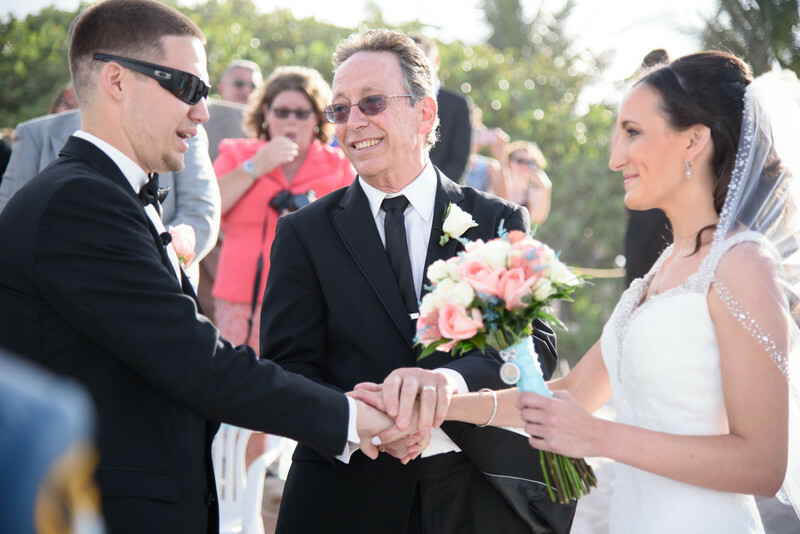 May 15 2015:.The wedding images of Dani and Daryl taken at The Jupiter Civic Center in Jupiter, Florida. Shown here, the proud father, beaming with pride joins his daughters hand with that of his newfound son in law. What a moment indeed. That....is why we do what we do. To capture the defining moments. The essence of true wedding photojournalism. Naturally the wedding ceremony itself is the highlight of the day.No wedding coverage would be complete without it.But, we raise this to an art form.By seeking out moments, seeking out angles others simply overlook, use tactics and equipment others only dream of; we bring every bride the absolute finest looks at her grand wedding ceremony.From wide to close up.Intimate, to hilarious. We capture it all. That look your dad gave you as you caught his eye as you walk down the aisle, to the tiny smirk your fiancé gives you moments before dad hands you over.Don’t miss a thing. Thats our credo. Once we have all the images, we of course will deliver them in an incredible wedding album, that features your day as it happened.Typically, arranged into each of the major themes for the days events such as shown below. As you can see that becomes a long list very quickly.Which is why we recommend adding as many pages to your album as you can so we can let your images have the real estate to do them justice in the album, and not make it too crammed so it ends up looking like a scrap book. (just kidding it would never do that) but you get the idea…some of the stronger images are best served by themselves while others can be combined quite naturally for a very effective story telling album design.You may want to check out our Featured Weddings section.What you see there, is the actual wedding album page designs for those couples.That way you can really get the idea of just what your album design will resemble.